UltraVNC is an enhanced VNC distribution. It's based on RealVNC, features TightVNC smart cursor handling and encoding, almost all the special functionalities that can be found in eSVNC and Vdacc-VNC, and a lot more. not a bad remote VNC but not for the novice. Team-viewer has my top pick for it's simplicity. Integrated support for SecureVNC plugin. Fix recursive clipboard issues when several VNC, RDP, VM, etc sessions are nested. Fix hangs in clipboard handling. Support for HTML and RTF clipboard formats. Support for Unicode clipboard text. Clipboard text is compressed when transferring. libjpeg library replaced with libjpeg-turbo which includes optimized assembly code for both x86 and x64. Zlib updated to latest version. DSM plugins no longer cause the server/viewer to send any additional messages or prefix bytes. This eliminates 41 bytes of network traffic per message. Immediately subsequent socket writes are coalesced to minimize unnecessary packets. This eliminates 40 bytes of network overhead for most messages, and more in other cases. Fix crash when changing framebuffer dimensions with cache encoding enabled. Fix disconnect when changing framebuffer dimensions. Throttling for mouse move messages to prevent saturating output buffer with pointer updates. Queueing implemented for outgoing writes; this eliminates some overhead from every message. Fixed recovery / resynchronization attempts in update handler due to bypassing DSM plugin when flushing input buffer, leading to unsynchronized encryption states. thank you very much for the last fix. Defaults settings could have been made better, video driver for improved speed needs a lot of work, lots of keys don't work remotely (not, I'm not talking about Ctrl+Alt+Del), otherwise a very good software. TeamViewer is outstanding, but UltraVNC shouldn't be downgraded because of it. They're both five-star programs. One of the best remote computing software I've ever used, I really recommend it. Programs like "TeamViewer", and "LogMeIn"
Teamviewer is what you need. It's nice. But if you want to use it over the Internet, for example: access computer at office from home, you may need a software like NeoRouter (www.neorouter.com). It helps you create a virtual LAN over the internet so that you can do anything just like in a LAN. Absolutely great for Vista, only mediocre for XP and older Microsoft OSs. There are odd configuration problems that pop up, performance isn't terrible, but also isn't as seamless as others, and the implementation of advanced features simply wasn't tested enough for them to have become default settings. However, they have the best standalone VNC viewer of all. 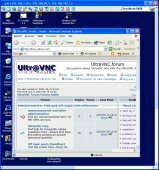 If you're running XP or server 2003 (or older), stick with the TightVNC server and use the UltraVNC viewer. If you're on Vista, it's UltraVNC all the way.